This video entitled Mind Shift is by the group World Order led by the well known mixed martial arts fighter Genki Sudo. Not exactly a dharma-burger but interesting. One thing military types are good at is dismantling something into it’s constituent parts and outlining that process, from an operational procedure to a tank to a country. Unfortunately the more complex the dismantling, the more difficult the reassembly becomes, especially when there is lots of death involved. But for now I’ll not go there lest someone think I’m wanting to indulge in soldier bashing in this post. Not so. My father was involved with the Canadian Army Engineering Corps as a Sergeant so that gives me an additional perspective here. It is: Armies do not cause war. That is left to others. Some of those others I’ll get to in a minute. The world of online communications does not escape the eye of the military in terms of delineating an outline and suggesting an efficient method of assessment. 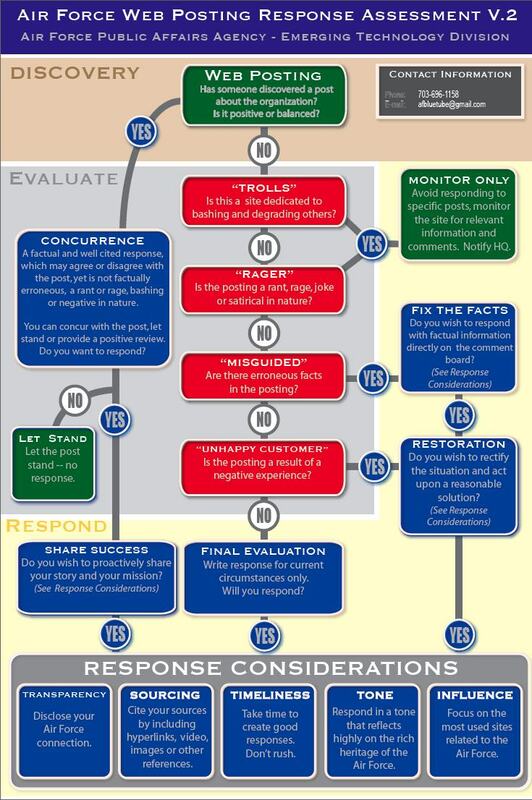 The American Air Force has provided it’s members with a lovely flow chart on mindful blog commenting entitled “Air Force Web Posting Response Assessment V.2”. I found it on the website Global Nerdy but it has been distributed far and wide as the trackbacks on that sight indicate. Click on the image for a larger size display. What can be noted here is the reasoning process that goes into both the decision to respond and into the content of the response itself. By taking the time to allow immediate reactions, particularly of an upsetting variety, to settle there may be a better outcome than a knee-jerk reaction. Questioning is an important part of serious Buddhist practice as well. And it isn’t just the big questions that matter. Sometimes smaller questions along the way can alter the entire outcome of a situation. A while back I came across a document entitled Thinking About the Business of Intelligence:What the World Economic Crisis Should Teach Us written by a couple of CIA analysts. It was part of a conference proceeding on security. There is much for intelligence professionals to learn from the follies of economists, and from this folly in particular. The lessons from folly are numerous indeed, as the various CIA follies over the years have demonstrated. But I don’t wish to indulge in CIA bashing (much) and instead want to examine a couple of interesting statements and conclusions that report cited brought up. It seems the CIA is discovering a few Buddhist principles. We are overly sanguine about how close our information and intelligence sources approximate reality. Our understanding of causality and sequence leaves much to be desired. …we, too, have an irrational attachment to rationality. We all tend to underestimate the importance of emotions when we attempt to understand the actions of world leaders or the sentiments of a population. This requires acknowledging that systems often viewed in the past as stable entities that need significant shocks to disintegrate are just as often veined with many minute and therefore largely unseen fault lines that can be activated by very small disturbances. And here we have another lovely chart, this time defining two different world views. Which world is the real world? Martial arts is something that has been an interest of mine for several decades. Shotokan Karate, that’s a traditional Japanese hard form, was my principle training method but occasionally teachers from other schools gave seminars incorporating things from such diverse practices as Kung Fu, Judo and even Tai Chi. My Sensei even took ballet classes to improve his flexibility and strength. He could do jumping kicks higher than anyone I’d ever seen, so perhaps it’s best not to taunt a guy in tights! Every martial arts teacher I’ve encountered has emphasized that training is more than just learning a series of movements. Attitudes, ethics, character, psychology, strategy are all important. For centuries the martial arts in Asia have developed and used short aphorisms or statements to encompass these ideas. Since these martial arts developed within a Buddhist influenced milieu there is significant input from the Buddhist perspective. In Japan, with the addition of Confucian philosophy, this even developed into a codified system of social conduct called Bushido and it was followed by the Samurai or warrior classes. This may sound familiar, especially to Zen practitioners. It is the same state one comes to in Zazen in the “dropping of body and mind” after one has practiced for some time. I find the terms “nothingness” and “detached” to be somewhat misleading in both the martial arts and the Zen contexts in that one is full of the moment instead of themselves and fully immersed rather than “detached”. One is not separate from events, surroundings or anything in these moments. The clarity is of the moment and that moment consists entirely of unobstructed movement. So I’ve gathered a collection of these maxims from a variety of martial arts traditions (Ohhh a list!) and put them into categories that relate to Buddhist practice. Since attention spans are so short these days perhaps one or two of these will remain memorable. The eyes and the mind travel together. The circulatory rhythm of the body is similar to the sun and the moon. The Way is centered in posture. Strive to maintain correct posture at all times. A strong attitude and posture gives an advantage. Following the Way is like scaling a cliff. Continue upwards without rest. It demands absolute and unflattering devotion to the task at hand. The Way begins with one thousand days and is mastered after ten thousand days of training. The true essence can only be realized through experience. Knowing this, learn never to fear its demand. Practice once a day, although more will cause no harm. Progress will occur when a void is found. Have confidence and your calmness will handle the situation. Always see contemplation of your actions as an opportunity to improve. The place of money cannot be ignored. Yet one should be careful never to become attached to it. The Way begins and ends with courtesy. Therefore, be properly and genuinely courteous at all times. The rewards of a confidence and gratitude are truly abundant. Pass on the tradition – Preserve this Way and rules of conduct. Fancy techniques should not be used. There are not many sets of exercises. They are easy to learn but to master them requires determination. Here is part of another set of these aphorisms. These are a little longer but encompass a couple of different aspects. Shu. Observe the old without straying. The student directly studies the teacher’s way. Ha. Break strict observation and adapt different teachings. This is the stage of experimentation and research. Ri. Leave, advancing beyond both former stages. The student goes beyond the teachings to develop a style within a style. This does not mean a new style is created; rather, that the student now places a new emphasis on his favorite teachings. Not new; however, view and perhaps taught from a new perspective. This new/old perspective is an enlightenment to the student. Shin Ken Hyaku Ja Futsu. or With a real (god’s) sword, dispel self-evil. Strong training brings self-attainment. Literally it means 100 trainings, self-attainment. After severe training 100 times (100 is equivalent to meaning infinity) you will receive attainment (understanding or enlightenment) by yourself. Flowing perspiration is the road to enlightenment. Spirit, Technique, Body. The three inseparable entities which create the whole martial artists. If one element is de-emphasized in the least, the person becomes unbalanced. Action of the heart. Do things through the heart. Normal state of mind. Maintain one’s state of mind or composure without being affected by the environment. Unaffected spirit. Hei Jo Shin no Michi. Rei Gi Shin Chi Jin. Courtesy, Obligation, Belief, Knowledge, Virtue. These are called the Go Jo, or Five Ordinaries (Confucian) and are considered the beginning of budo (budo no hajime). Without these five Confucian ethics the martial arts devolve into brutish brawling. The naked entrance and exit to life is the one experience all humans share. Everything that happens between those two points is utterly unique. The assets portion was the interesting point. In Hinduism, with it’s belief in literal reincarnation, the notion of accruing in one lifetime is not often discussed and even downplayed in favor of a much longer multi-incarnate view. This more immediate focus is somewhat reminiscent of the Buddhist viewpoint and particularly that of Zen. To me this makes the nature of Sunyata and further of Samsara an incredibly rich and valuable asset. There is no mirror which does not reflect all others. There is no thread which is not entangled with another. As much as one might like to posit uniqueness it is not a uniqueness that stands apart from all other uniquenesses. The recipes vary infinitely yet the ingredients are all of the same kitchen. All. Assets and Entanglements. With a little Masala. About Jisei, Japanese death poems. Japanese death poems from a Salon article. A piece about forms of the poems, Samurai and Seppuku (ritual suicide) in which the death poem was one of the steps in the ritual. Here is an essay from the Tibetan tradition which includes the Signs of Dying called DEATH AND DYING IN THE TIBETAN BUDDHIST TRADITION just so you know when to get your pen and paper out. Last month I became engaged in a number of comment debates at various forums. While the particular issues have been pretty much settled, …well as much as things get settled on the Internet, I am left considering the utility and tone such debates take. Debate is something I have always enjoyed. Not necessarily to be right (although once in a while…!) but to get out all the aspects of the point of contention and examine them. Hidden agendas and logic traps are not really my forte as I tend to be rather direct in what I say and mean it. Debating to learn something and to clarify one’s own viewpoint with the assistance of others is a valuable activity. I enjoy the valid points that other people make and if my arguments are demonstrated to be invalid then the benefit is to me. Debating ideas, issues and viewpoints is one thing, but debating personalities or non-related matters is something else. And in these forums it makes very little difference who “wins” or “loses”. There is so much material out there that these things are usually quickly forgotten. That doesn’t make it a useless activity however. I find that by viewing or participating in these issues that I can refine my viewpoint and get to know where I stand in relation to others. Sometimes the issue is rather significant. Sometimes it involves a little sweat to bring it to attention and work through it. And even with all the material out there, some of it rather innocuous and some of it injurious, to make available well thought out reasoned points contributes to increasing the quality of discussion even to a very minor degree. That is one of my motivations it seems. Another is to share whatever knowledge and experience I have with anyone who finds it useful-even as a point of debate. And I take from it the opportunity to be challenged by different viewpoints and to learn whatever is available to learn in any given situation. My view is generally one of a win-win situation. Many people confuse debate with angry argument. Argument is usually a venting about some unrelated issue and tends to lack any sort of rational control. In argument people don’t generally bother to listen and take in the points made by others. Gloating is common and nothing is off limits in anger arguments. I am not always successful in keeping anger out of things. Most people aren’t. As an aside it seems some folks mistake my debating style for anger. And even in this blog when I make strong statements it seems that may be interpreted as anger. There’s not much I can do about people’s interpretations of what I write or say. But I can say when I am talking about strong topics I am not sitting at the keyboard with steam coming out of my ears and just seething with rage. As far as I can recall I’ve only vented anger twice in this blog-once at the arrogance of Paul McCartney telling HHDL what to have for dinner and again at someone who left a non-comment on the blog. I am not an anger junkie just because I have a strong opinion on some stuff and state that opinion. Debate and even spirited debate is a valuable tool for self-control, mental discipline and clear thinking. It gets to the crux of the issue and if not resolving differences at least respects them. I learned this approach in martial arts practice many years ago. In karate we would often practice with another Karate group that had a slightly different style. They were taught to acknowledge any point of the opponent by bowing to the opponent. It was not only a point in the sense of a score but a point made in learning one’s own limitations and weaknesses and providing a humbling moment. There will always be someone with more “points” in some area. Since I am on the topic of debate it might be pertinent to discuss some things about Tibetan Buddhist Debate which has been an interest of mine for the past few years. Part of the curriculum in the education of Tibetan Buddhist monks involves debate. It is a somewhat involved process that includes verbal and physical actions in a well defined format. It’s purpose is to expand the mind, gain clarity, increase mental and analytical capacity. One is required to think on one’s feet. When I first became interested in Tibetan style debate it reminded me a little of Toastmaster’s clubs but to an nth degree and always within a specific subject area. Toastmasters are clubs for the purpose of improving public speaking and confidence. At their meetings it is often a requirement for members to stand up and give scripted or impromptu speeches on diverse topics. In the Tibetan debates there is a defender and a questioner. The questioner is usually one with experience in debate while the defender will be a novice or less experienced. The debate usually begins with a ritual invocation of Manjrushri, the boddhisattva of wisdom. Then the questioner, who is standing, begins the debate. He will speak gently to the defender, who sits, as a sign of humility and respect. The questioner wears his robe in the customary style initially, with the left shoulder covered, and the right shoulder bare. The gentle introduction is part of a strategy designed to bring about a false sense of security in his opponent. The defender will then present his thesis. The questioner begins to raise doubts. The exchange of questions and answers will rise and fall in intensity and with the points made. The debate will often continue for several hours as these points are clarified and errors corrected. If the questioner spots errors or contradictions he will step back and make strong gestures and often wrap his robe around his waist to demonstrate his control of the topic. Hand clapping will stress the definitive points of argument. Part of the reason for this form of debate is that it helps to make learning Buddhist philosophy, sometimes a rather dry subject, more interesting and as opposed to simply reading a text it makes both participants really think deeply about the subject. It also helps to encourage the morale of the monastic sangha and reinforce the idea of interdependence in everything including learning. A scholarly work by Daniel Perdue explains the form of logic involved in these debates. The title of the paper is The Tibetan Buddhist Syllogistic Form (pdf). Extending the left hand forward symbolizes closing the doors to the lower states of rebirth. Clapping the hands represents the union of the two aspects of the path. The left hand symbolizes wisdom and the right hand method. Deliberately and slowly the right hand is drawn back to signify the wish to liberate all sentient beings. Sometimes one also sees the right hand being turned in the “touch the earth” gesture at the same time. The questioner will circle the opponent’s head three times with the right hand, while saying , “These are the three circles.” (di khor gsum) which shows the defender has made a mistake or a false argument. The wrapping of the upper robe around the waist is a sign of understanding and being in control of the topic. A young student of this Tibetan debate style has made a short movie to illustrate how it works using simple constructs. The logic is rather strict and the method a little repetitive but it demonstrates the pattern in this particular debate style. And a Bit of Comedy? Cultural Appropriation? Disrespect? Someone has decided to take video of monk debates and chanting and add their own script in the form of subtitles. In the YouTube comments some people find it funny and some are offended. I’ll leave that decision to you.